​ The Royal Academy of Arts (“RA”) is dedicated to promoting not only the understanding and appreciation of art but also its practice. Consequently, the RA is a combination of museum, art school, fine arts library and artistic society. In 1768, a group of artists and architects petitioned King George III for permission to establish a society for promoting art. The King agreed and the RA was founded, soon becoming the most prestigious artistic society in Britain. From the beginning, the RA was run by artists. Its first president was the portrait painter Sir Joshua Reynolds. It continues to be an independent charity that is led by practicing artists. 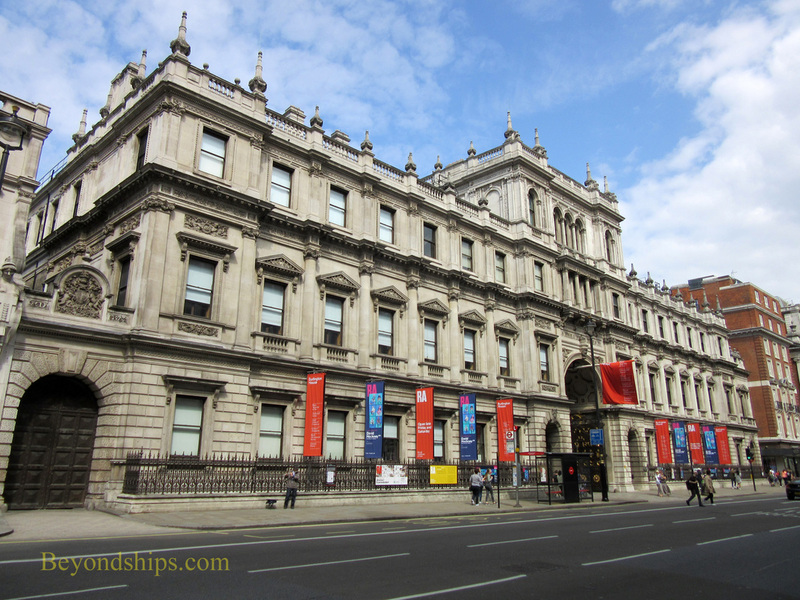 The RA has had a number of homes but since 1867, the RA has been headquartered in Burlington House off Piccadilly. Dating from 1664, this building was originally one of a number of private mansions along the north side of Piccadilly. In the early 1700's the Third Earl Burlington had it transformed into a great Palladian structure. In 1854, the British government acquired the house with the idea of demolishing it and using the site for the University of London. However, there was such protest that the government abandoned the plan and instead gave it over to five learned societies including the RA. The building was enlarged during the 19th century to suit this role. Burlington House is built around a central courtyard. The RA is housed in the main block facing you as you go through the entrance gate. The wings on either side are occupied by the other leaned societies. The fact that the RA is housed in Burlington House is significant because the building is of architectural interest as an example of British Palladian architecture. In addition, the rooms still have traces of their original decoration. Because the RA has been such a prestigious society, British artists have sought to be members of the RA over the centuries. 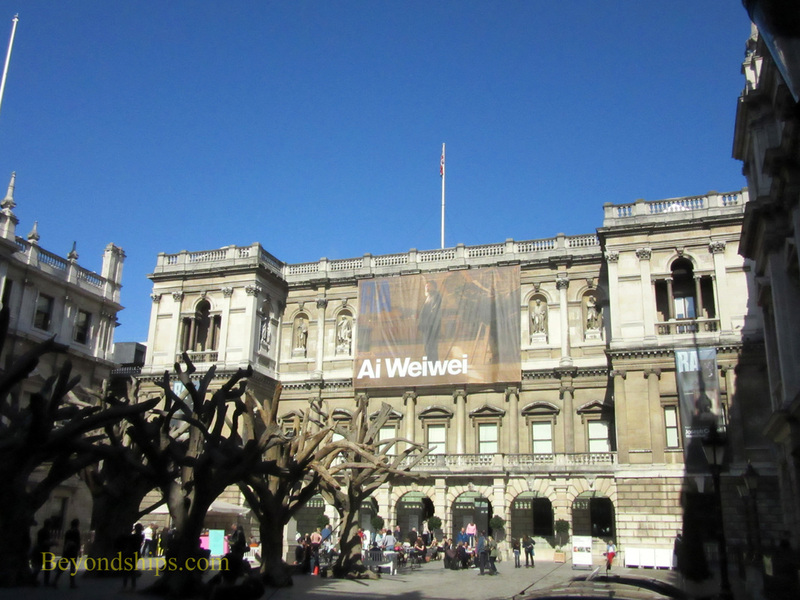 Each artist selected to be a Royal Academician is required to give a work to the RA. As a result, the RA has an important permanent collection. Works from this collection are displayed around the building. In addition, the RA has works from artists from other countries. Most notably, it has the only marble statue by Michelangelo in the United Kingdom. 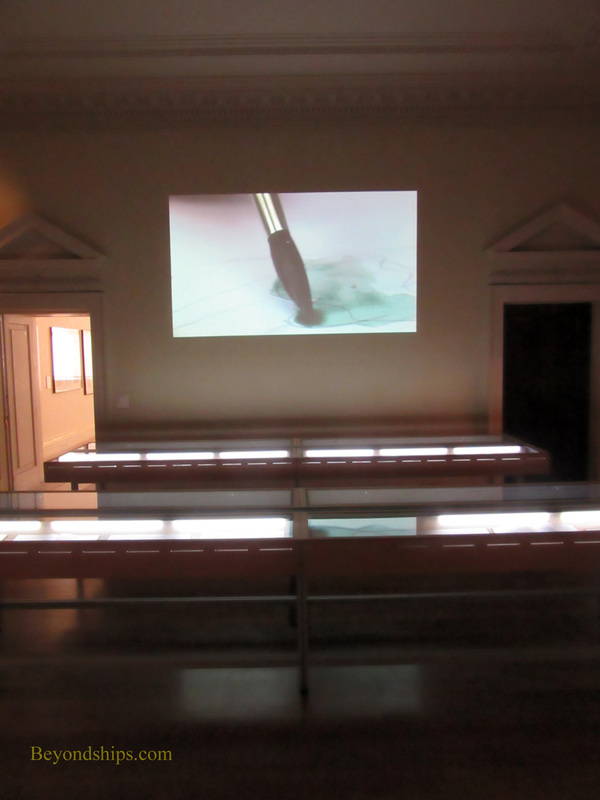 The RA also presents temporary exhibits of works on loan to the RA. It boasts that it pioneered “blockbuster exhibits” and indeed its temporary exhibits attract hundreds of thousands of visitors. Each year since 1769, the RA has held its summer exhibition. The exhibition is open to all and thousands of works are submitted each year. The works exhibited are selected on merit and so it is quite prestigious. It is also a social event that includes a parade down Piccadilly. There is an admission fee for some exhibits. However, there are free tours of the building. The RA is open every day except December 25 and 26 from 10 a.m. to 6.p.m. (The hours change somewhat around Christmas). The RA has two restaurants - - the RA Grand Cafe and the Keeper's House. For more information, see the RA's website. Above: The courtyard looking toward the RA. 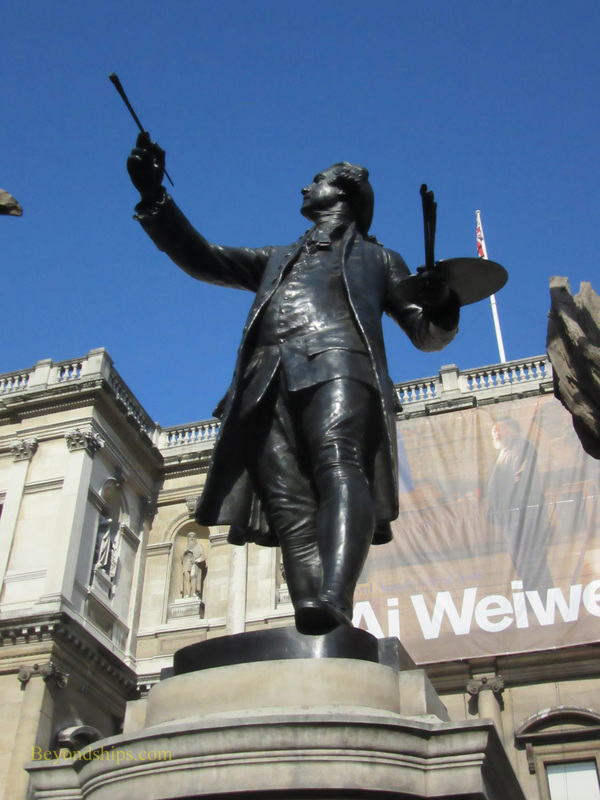 Below: In the courtyard is a statue of Sir Joshua Reynolds, first President of the Royal Academy. 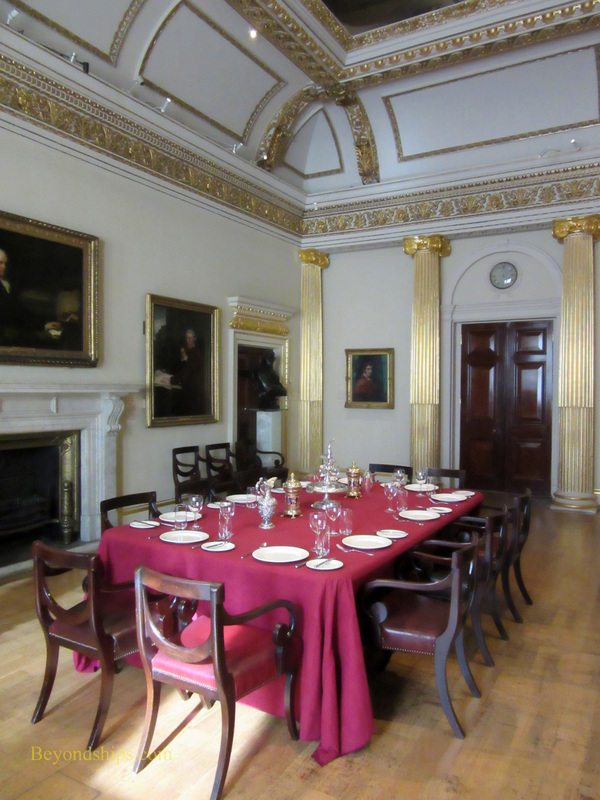 Above: Some of the private rooms recall the days when Burlington House was a nobleman's mansion. Below: The Ra is also a very competitive school for artists.